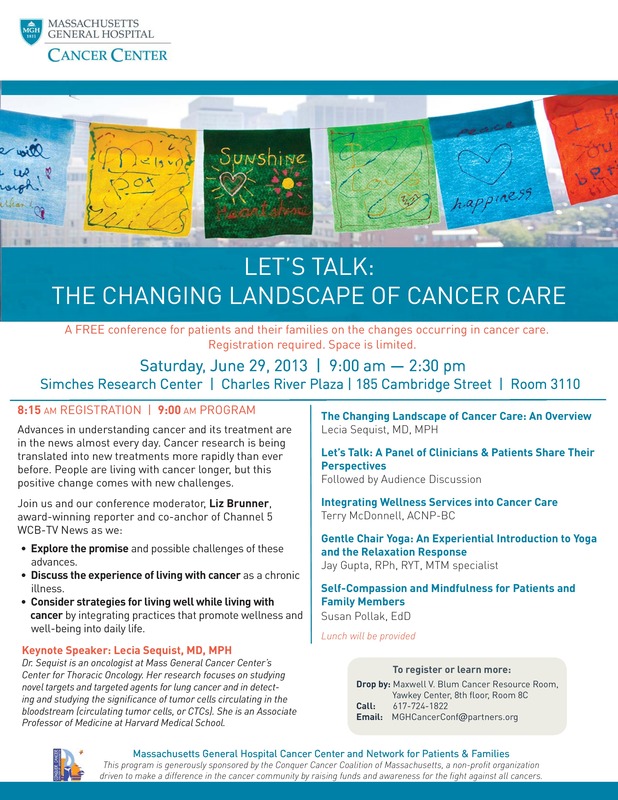 If you are living with cancer and reside in the Boston area and haven’t made plans yet for Saturday the 29th, I’d like to suggest that you attend this free conference provided by the Massachusetts General Hospital Cancer Center. My beloved yoga teacher Jay Gupta is a presenter (yea! ), and the entire program looks very interesting. I will be in the audience, so please say hello if you are able to come! PS: There will be room for walk-in registration, so don’t hesitate! This entry was posted in Coping and tagged Massachusetts General Hospital Cancer Conference, Massachusetts General Hospital Hopes Program. Bookmark the permalink. Oh, how I wish I could be there! Take good notes for me, please? I did, now I just wish we could go out for coffee and talk about them! I sent you contact info as a message on Inspire. Hope we can talk electronically until one or the other of us gets to the opposite coast. Darn! First I heard about it. Thanks Linnea. Do you want to carpool?